First of all, we would like to wish you all a Merry Christmas. Working with you this past year has been a gratifying experience. We hope that as your custom waterjet cutting services provider, we were able to meet your requirements. The entire year of 2015 has been a memorable one for us as well. We have had some amazing projects. We have also had the opportunity to renew relationships with our existing customers, while strengthening ties with new clients. As all of us prepare to welcome 2016, we are taking time off to celebrate this occasion with friends and family. Our offices and factories will be closed for the holiday season. For Christmas, we will be closed from 24-Dec-2015 to 27-Dec-2015. 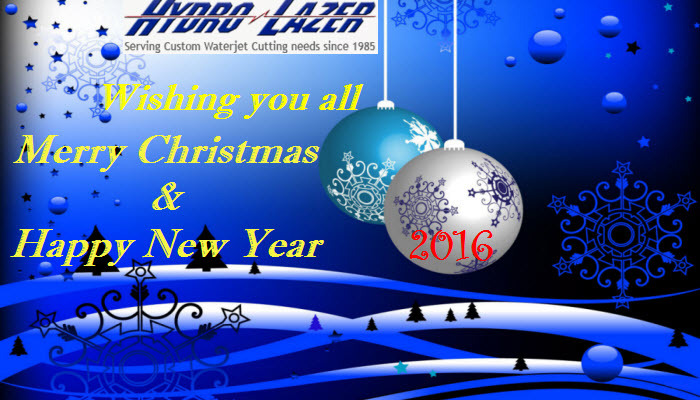 Hydro-Lazer will reopen its doors to customers in the New Year on 03-Jan-2016. For customers who already have pending orders, we are working as quickly as possible to ensure that your project is completed and delivered to you on time before the holidays. For now, the entire Hydro-Lazer team would like to wish you all a very Happy Christmas and a Prosperous New Year 2016. This entry was posted in waterjet cutting services by Hydro-Lazer. Bookmark the permalink.